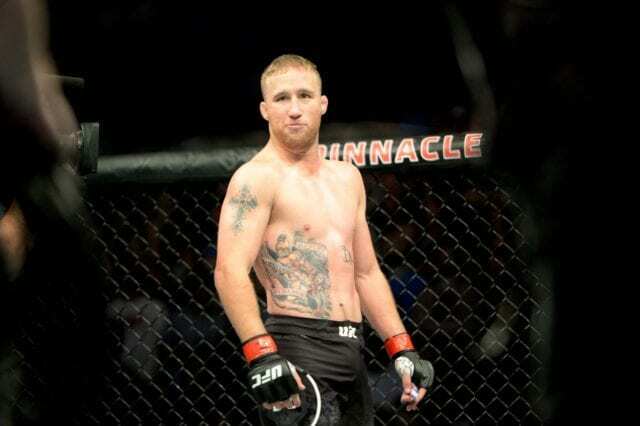 Justin Gaethje has been involved in two ‘Fight of the Year’ candidates in his two years with the UFC, but he feels he has little to show for it. He was scheduled to fight Al Iaquinta in the main event of August’s UFC Lincoln, yet had to settle for James Vick when Iaquinta withdrew for a new contract. Gaethje won that fight by thunderous first-round knockout. He just doesn’t feel like it’s gotten him anywhere. Iaquinta, meanwhile, got his new deal and faced top contender Kevin Lee at UFC Milwaukee. “I’m f—ing pissed, man. I’m pissed about a lot of things. I’ve been involved in Fight of the Year the last two years, and that’s all f—ing cool and it sounds good to fans, but I don’t get a damn thing for that. Gaethje may have a good point there. It seems the sport of MMA has gotten to a sort of tipping point where fighters are ready to speak out over perceived poor treatment from the UFC. Until they are willing to organize and/or unionize, however, nothing is going to get done. In the meantime, Gaethje also knows he can’t sit around and do nothing in a division as stacked as 155. There’s no denying Gaethje is one of the most entertaining fighters inside the cage. His bouts are almost always all-out battles due to his style of constantly moving forward. Due to that fact, he believes he should be paid his full fight purse each bout, not only if he wins. He’s brought that up to the UFC before. He acknowledged he had a good conversation with his bosses recently. “They should say, ‘Yes, you deserve it, congratulations,’ and put it all over the media,” Gaethje said. “Let everyone know there is a way to achieve that. They should use me as an example for that — but I’m pretty biased when it comes to myself. Most fans wouldn’t argue with that assessment in the slightest. But in today’s uncertain UFC climate for fighters, you’re only as good as your last performance. While Gaethje’s last fight was a great win, it wasn’t necessarily over an opponent that would elevate his public status in any way. He’s most likely justified to feel that his star power is stagnating as a result, so a win over an exciting striker like Barboza should help him get back on track.